Sprinkle the florets with salt and steam for 8 minutes until slightly tender but still firm. In a heavy sauce pan over medium heat, add 2 of the tablespoons of Butter olive oil and heat. Gradually whisk the flour into the olive oil until no dry spots remain. Pour the hot milk and hot half & half into the oil-flour mixture, whisking constantly until it comes to a boil. Continue whisking constantly for 1 minute until thickened and then remove from heat. ½ cup of the Gruyere, and ½ cup of Parmesan cheese. Grease a 2-3 quart shallow baking dish or casserole. Place the drained cauliflower in the baking dish and pour the sauce evenly over the cauliflower. In separate bowl, combine the remaining tablespoon of butter olive oil with the remaining teaspoon of truffle oil. 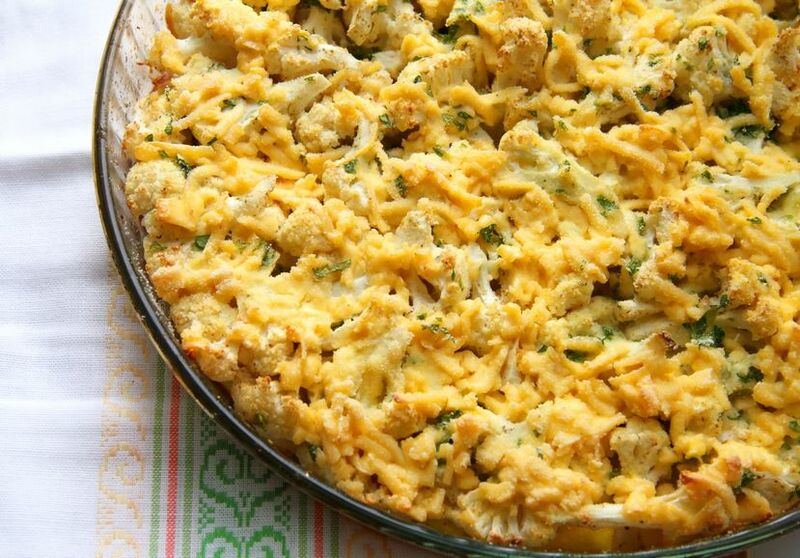 Toss with the bread crumbs and remaining ½ cup of Gruyere and sprinkle on top of the casserole. Sprinkle with more salt and pepper to taste. Bake for 25 to 30 minutes until golden the bread crumbs are golden brown and the casserole is bubbling.